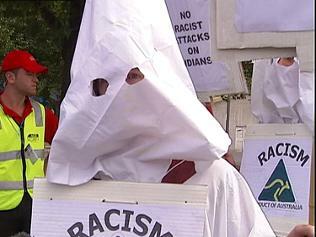 KEVIN Rudd’s nephew proved my point when he stood outside the Rod Laver Area on Australia Day in his badly sewn Ku Klux Klan outfit. I mean, if we weren’t so desperate not to seem racist, we might not seem so very … racist. That’s not the point Van Thanh Rudd was actually trying to make, of course. He’s an artist and Marxist activist, and went to the tennis in his KKK outfit – with a “No racist attacks on Indians” sign – to announce that what was really behind all these bashings and killings of Indians was white redneck racism. The legendary Australian sort. But here’s where he made my point instead. The very day before, two more Indians were bashed in Swanston St.
Their attackers? Once more it was – allegedly – an ethnic gang. An Asian one, in fact, or so police allege. For Thanh Rudd to protest that such a bashing, of Indians by Asians, is proof of white racism shows exactly the dangerous dishonesty there has been here in discussing race and crime. The fact is many of the attacks on Indians in Melbourne seem to have been carried out by members of recently arrived racial minorities, whether African, Middle Eastern, Maori, Pacific Islander or Asian. In one three-month period, for instance, all 12 attacks on (mostly Indian) taxi drivers in the Flemington and Moonee Ponds area were by Africans. Our media and police have been very reluctant to admit such things, as usual. In fact, then chief commissioner Christine Nixon even banned the word “gang” and claimed – falsely – that Sudanese and Somali refugees here did not have high crime rates. Needing scapegoats, though, Anglo racism has been singled out for blame instead, since it’s well accepted that only whites may be racist. And so Australians generally are now being monstered in the Indian press as racists of the KKK kind, while at home we still refuse to discuss street violence – and the rise of the ethnic gangs behind some of the worst of it.